My Kindle Fire HD arrived yesterday and now that I've played with it for a few hours I wanted to post a word of warning. There's at least one detail about the KFHD (and the 2nd-gen KF) which should give you pause. Do you know how the KF is described as Amazon's portal, and how they want to use it to sell you stuff? This was well known even before the original Kindle fire launched, and Amazon's intention to sell stuff was confirmed by subtle details like the fact they blocked competitor's reading apps from being installed from the Amazon Appstore. All this is well known, but it's not completely true. While the original Kindle Fire existed so you could buy stuff from Amazon, the new models exist so Amazon can pitch content and sales to you. Do you see the difference? While the older model is a consumption device, the new ones are advertising devices. It's not just that the lock screen has ads; Amazon has also rigged the KFHD so you cannot easily replace the lock screen with a different one. I've tried several, and Amazon's ads have not gone away. And there are also the ads at the base of the home screen, something we knew before the KFHD shipped. But those aren't the only sales pitches with which Amazon bombards users. At the bottom of the home screen is a second set of product pitches labeled "Customers Also Bought" where Amazon displays more content for you to buy. Amazon has also rigged the KFHD so you cannot easily replace the home screen (unlike the original Kindle Fire) so they're not going away even if you pay the $15. Clarification: I've found and installed several alternate home screens. The KFHD refuses to allow me to open them - even though they validly installed. Note that I'm not saying that you should or should not get a KFHD, but be warned that this tablet belongs to Amazon, not you. One reader wanted to know why I bought the KFHD but wouldn't buy the Nexus 7, even though they appear to fit in the same basic niche. I got this tablet so I could take a look at Amazon's business model. Thanks to the advertising the KFHD is really not in the same product category as the Nexus 7 or any other Android tablets. While they all run Android they were designed with very different goals in mind. It seems to me that Amazon has taken B&N's idea for the Nook Color/ Nook Tablet to heart and built a walled garden where Amazon can constantly throw advertising at you. Frankly, this isn't a media tablet anymore. This tablet doesn't exist so you can do stuff and it doesn't exist so you can consume content. The KFHD is in your hands just so you can be advertised at. If you buy one you need to keep that in mind. Thanks for the critique. I think I’ll be waiting a long while before I get a tablet. If I ever do. My laptop works fine and I have an e-reader. >My laptop works fine and I have an e-reader. I am new to ereader and deciding that I can save trees, library space, and tons of handling by having an e library, cost of bookshelves and space… but I am confused about how this works. I was under the impression you can just download free books from your local library, or, buy them from anyone who produces ebooks. I have friends who bought a subscription to 6000 books and use a hardrive and nook to read and transfer? I want an ebook that provides clearer images, and the original nook looked to grey for me, the color ones are more appealing, but want a HD device.. after reading studies. I read very very fast and also heard that paper is still better, but tired of carrying around heavy books and storing them all, shipping, expense, and trees departing. That 6000 book subscription is a scam. Your friend either paid for public domain books that are available for free pretty much everywhere or he paid criminals for pirated ebooks that are likewise available for free in the less reputable parts of the internet. The way commercial ebooks work is that you buy a license to read the book as many times as you wish, not a file. The store you bought the ebook from keeps track of your purchases so you can always redownload the book when you need it so you don’t necessarily need a hard drive to hold your books. That is the good side of the license model. The bad side is that you can’t resell the ebook license the way you can sell a dead tree book. You might want to stop by the MOBILEREAD Forums. There is a forum set aside for newcomers looking to get into ebooks where all sorts of friendly folks will be happy to help you find a reader device that will fit your needs and budget, whether eink reader or a tablet. Just don’t pay for ebooks unless you are sure you are dealing with somebody authorized to sell them. Otherwise you are throwing your money away. The good news is you can view your local library selection BEFORE buying any device. Check at your library–go through some of the titles and see if you like the selection. Because ebooks never wear out, publishers do not make many books available in ebook format to libraries. There’s a decent selection, but if you are a fast reader, it may not have enough books for you for very long. For some reason, changing backgrounds has been a huge pain in the rear. Amazon and other vendors want to use it as ad space. It’ll change. My advice is that if you have a smartphone of some sort, load a reading app (Kindle, or Epub) to it and give reading ebooks a try on it. That will really help you decide which device you want to buy for just reading books!!! Paid the $15 + tax after I saw very first screensaver. I could not get those ads off quick enough. I don’t mind the related books nearly as much, though. I would have done so but I’m still not sure I’m keeping this tablet. Also, I wanted to continue to slap myself with them so I could better feel for how Amazon works. You can still sideload alternative apps? Say Coolreader3 or Dolphin HD browser? Yes, but it’s getting increasingly harder to find them. Do the ads ever interfere when you’re actually consuming content (watching movies, reading e-books, etc.) on the device? Amazon’s previously been pretty good about not interrupting you while you were actually reading. The ads interrupt me when I am switching from reading to playing a game, so yes they do interfere. That’s why I chose the Nexus 7. Standard Android system, that was the thing. No adverts, and I can have all my apps on one device. Before this, I had a rooted Nook Color, and that worked well, too, but the Nexus beats it. That must explain why they are only charging you $15 to “remove the ads”. I have a Paperwhite on pre-order. If Amazon’s more aggressive stance regarding ads and content pushing permeates the Paperwhite it will go right back and I’ll get a Kobo instead. I wonder when any of the Tech websites will get devices to really review. So far it’s nothing but previews and press releases. Kobo is real fond of their ‘recommendations’ too so I’d wait for reviews before deciding it’s any better than the Paperweight in the content pushing regard (assuming there is a problem with the paperwhite). I’m with you though. If the PW has in your face content pushing mine will likely go back, they can keep that for their website and off my device. You’d think they would have learned from authors. When the authors pushed too hard on the forums, they got kicked off. So, uhm, why doesn’t Amazon get that? The reviews on Amazon are rather consistent about the ads being intrusive. One poster says they hide the clock? Another couldn’t get Youtube, Netflix, GPS or HBOGO to work along with many 3rd party apps. And a third said he couldn’t stream from the cloud. I’ve used Youtube extensively and HuluPlus app on it. Haven’t tried Netflix yet. These people should reboot their machines and try again. There is also a software update for it that is no doubt automatically put on it when WiFi is enabled. I was not paying attention, but I did have to reboot before my video-viewing would work right. Youtube has one video today that needs a recent Adobe Flash player. I guess they’re not on HTML5 completely for alternate access. I put an Adobe Flash Player file on, which was one of 3 recommended at XDA developers for the Nexus which doesn’t have Adobe Flash support either, partially because Adobe stopped the support of mobile browsers with the current player file. But I can now access network TV shows again (that require Flash) though I also have to (prefer to) use Dolphin browser and can change my ‘User Agent’ to ‘iPad’ which has some rights on some websites or ‘Desktop’ which gets me videos that when my device is seen as ‘Android’ no video can be shown due to rights they couldn’t get. The ad is just like the sleep-screen on the e-inks — they are full screen too. Some are special offers, some are just ads. I don’t see them until I approach the KFire and open up the cover and when I pull the strip on the right to start, it’s gone. The tech-site reviewers going on about the ‘assaults’ of ads have their columns surrounded by sometimes pulsating extreme-colored ads all over the page. Their company staff needs to eat too. The Home screen text line at the left bottom is so small I have not even noticed it in 24 hours. I was going to pay the $15 but now am not sure, because I did see some things of interest to me and they don’t last long if I’m not interested. The ‘recommended’ for you is pure Barnes & Noble, as you suggest (though they will not allow installation of apps from ‘unknown sources’ as Amazon does. The Sound is SO superior to anything else tablet-wise (including Nexus and iPad’s lone mono speakers) and so convenient when I don’t care to wear headphones or hook them up to speakers and the spatial characteristics so nice, that’s a large part of the entertainment value for me. Music and movies – the latter have to have decent sound. They fit in double the storage size of Nexus, moreover, for the lower $200 and offer (for me) the very useful feature of being able to pause a movie that’s been ‘X-rayed’ to get information on cast and a summary (while high-tech reviewers grumble they don’t have the ENTIRE IMDB listing of every detail listed of course — it’s so ‘cool’ to find every which way the KFire HD cheats the customer) . The syncing every which way with all manner of devices takes a lot of server power to coordinate and is also difficult to do. That’s why you don’t see it done by other content deliverers. Apple delivers to Apple. Yes, it’s a consumption device. And Amazon (surprise!) encourages you to buy and, at the press conference, said that’s how they aim to make their money. It’s so easy. If it’s offensive, get another device. As you say clearly, they are devices with different audiences. However, I in no way buy that it’s not a tablet. It’s just a tablet with ads that offend people if they don’t want to pay $15 to get rid of them. But I, too, would rather not have the look-see-buy recommendations but it’s the “price” I pay for what is, besides what i mentioned above, currently the best brightness/contrast and angle-viewing you can get on a 7″ screen (this is agreed on by anyone who’s seen both) and has double the storage when large HD files are a part of the mix — it’s clearly the better tablet for entertainment that’s easy to get and abundant. The Prime Instant Video catalog is now really large but doesn’t of course have the latest and greatest. Other people providing buyers things hope to get some money in exchange for that. But if people want total freedom to get all the apps they can and that’s the focus — a build your own climate mechanism — then it’s something like the Nexus that should be favored, though I won’t be dealing with any 8GB storage device at this point with one mono speaker and inferior display. I’m going to ultimately get the 32GB KFHD 7″ as what I consider minimal storage for an HD file entertainment rectangle that may need to handle files 3.5 times larger than SD. No the original KF was a consumption device. This new model is an advertising device. There is a marked difference. Amazon is, first and foremost, an advertising and marketing company, for itself and for all the 3rd party vendors (which I have read gets it more of its profits). It exists TO SELL (whether web services or physical items) and if you didn’t notice it on the tablet or on ALL the last year’s e-Ink devices, then you’ve been sort of asleep. The biggest no-no here has been Amazon’s aping Barnes and Noble on the home page’s “Recommended for you” or “We think you’d also like” which Barnes and Noble *got away with* for well over a year, saying boasting “We don’t have ads on our Nook reader” and people on almost every tech site *bought* that. Was it because it wasn’t seen in color? Or that tech sites pay little attention to actually using a b&w reader? In B&N’s case, it is about 40% of the Home screen and it’s audacious to advertise that the Kindles have ads while B&N doesn’t and pathetic to me that tech columns actually buy that statement and then go into apoplexy when Amazon takes a cue and uses it too. The KFireHD is for consumer types — but Amazon will overdo it and customers will rail rightly. But until Amazon pulls back and make some settings optional to see (or not) ‘Recommendations’ on the lower Home page (or in some other places I didn’t come across in 30 hours of using it because I was in Landscape mode), do use it in Landscape if you keep the unit. OR, best, don’t buy it. It’s mainly for shoppers and always has been. So is the Amazon site, believe it or not. It’s not the tablet for people who mainly want apps or go to Amazon and try to use Prime video streaming with a rooted tablet (or the iPad app now) and don’t want to pay much for either the entertainment or the better hardware that buying of content makes possible, which Bezos said clearly. But some want both the better hardware and don’t want to pay more cash or see more ads for it. For those, I say get another type of tablet, and your digestive system will thank you. The stress of seeing ads is not worth it. True, Amazon is a marketing company, but I still think there is a big difference between the original Kindle Fire and the KFHD. It might be only a matter of degree, but the KFHD is much pushier about marketing at you. In six months from now everyone will be use to it and it will be a moot point. You have brought this up in all your posts that I have read. While you complain about the ads, this will be the number sold android tablet this year. I am not saying this because I am a fanboy. It will be number one because it will be available everywhere and Amazon will promote it and it’s big brothers more than anyone else will promote it. Plus the speaker system is awesome. I can’t wait to hear what the 8.9 inch mocel sounds like. I think you over-simplified the tablet owning market. Not everyone is going to be used to the ads in 6 months. Those who can’t stand the ads will either return the KFHD or pay Amazon’s extortion. If I can save them the effort of buying one just to return it then my posts are worthwhile. And BTW, I believe I only mentioned the ads 3 times, including the first where I say it’s not a big deal. Also, this post above is as close to neutrally worded as I can get. I do not see why you object to my writing about them. Except I meant that in the plural. There are 3 KFHD tablets. View in landscape mode (much easier for web anyway (double-click to make the words larger while wrapping) and in that mode there are NO recommendations. I never saw them for that reason. Kindle owners REALLY need to raise a fuss about this issue before it becomes accepted. It’s like the commercials in movie theaters. I can remember when they first began – just one commercial before every movie – and nowadays when I go to the theater I can expect at LEAST three straight commercials before they show me a couple of UPCOMING FEATURE trailers. Or worse – those little ad-bars that run under almost every television show I watch these days. You know, the ones that advertise upcoming television shows? I know that they are there to hopefully combat channel-surfing and our limited attention span – but how long before television networks begin airing actually commercials (while you watch GRAY’S ANATOMY you could be washing with IRISH SPRING soap!). Kindle owners need to make their disapproval of these “inserted advertisements” before they begin to trend dangerously towards acceptance! Such sturm and drang. Bite it. Amazon wants eBooks to be free — everything to be free — with ads in them. But I don’t want to sell my ebooks for free. And how do they really make money off free books? I get that they can potentially gain market share by bragging about all the free content, but that only works for a few months or so. You already see complaints that the freebie content is all repeats. Sure, there is some new stuff, but not even indie writers can write that fast. And if the indie writers don’t make enough money that’s going to cause them to write slower. What’s the big rush if you just get to have a ranking in the 3k for a couple of days, sell 100 actual copies and then drift to oblivion? How did you miss the part that said “with ads in them”? They make far more money selling books than advertisements otherwise the books would already be free. Advertising isn’t what makes money. It is people buying from advertising that makes money. Nate, I am not objecting to what you are saying. In fact, i really see your point. So, an unlimited amount of ad-supported free digital content. Isn’t that just the internet? Yeah, I always hate spending a lot of money for a product that turns around and pushes advertising at me… One of the reasons to *pay* for something is so they’ll stop pounding me with the adverts. I have the Kindle Keyboard with special offers and the ads have never been a problem. I don’t look at the screensaver for more than the fraction of a second it takes to turn it on or off. I ordered the 8.9″ Kindle Fire HD and won’t get it until November, but I don’t expect the ads on it to bother me anymore than they do on my K3. I don’t look at the screensaver of my Kindle Fire either; I never understood all the fuss about wanting to replace the picture. As long as the ads aren’t actually IN the content, I couldn’t care less. I find the ads annoying and the fact that I can’t customise the home page (I loathe the carousel as well). However, I’m not easily swayed by ads and I just ignore. In fact if I’m intending to buy anything online I’d use my laptop and search the www for the best deal using online vouchers and cashback sites to boot. If Amazon think sticking an ad in front of my face is going to make me buy from them they’re sadly mistaken. I think many of you are overreacting to this. Many apps are ad-driven, and for those that don’t like it, they simply pay the .99 cents for the full version. It’s the same with the Kindle Fire. If you don’t like the ads, just pay the $15 to remove them. 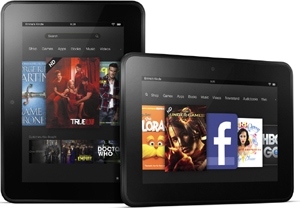 Or you should have bought the “ad-free” Kindle Fire in the first place. The recommended content section of the home screen is also ads, and that wouldn’t go away if you paid Amazon’s vig. Luckily they did eventually let you disable that set of ads.